Why you Should Tweet your Post Multiple Times? 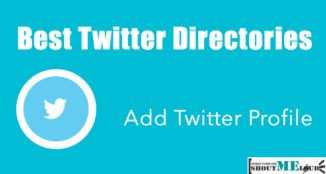 We have been talking a lot about Twitter lately, and if you have missed How to get more followers on Twitter, I highly recommend you to read it. Twitter is one of the top 5 Traffic sources for ShoutMeLoud. I often get into a discussion with my fellow bloggers on the way of tweeting the post. Is it good to tweet your post multiple times or just tweet it once? 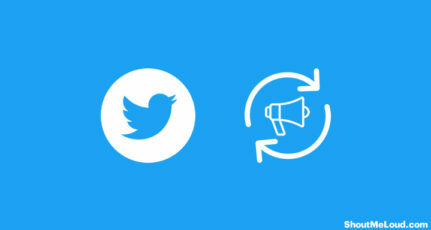 I always suggest and recommend to tweet your blog post multiple times. As followers, you have on Twitter are from different time-zone, and you have to make sure that your tweet is reachable to most of the people who are following you. You have a follower from different parts of the world and probably when you have tweeted your post, another side of the world may be sleeping, and you are missing a great amount of traffic. Moreover, your readers are missing a useful blog post. For example, I have most of the followers from India and U.S, and I have different effective time for sending tweets to target both the country followers. This is also similar to sending Email at the best time. 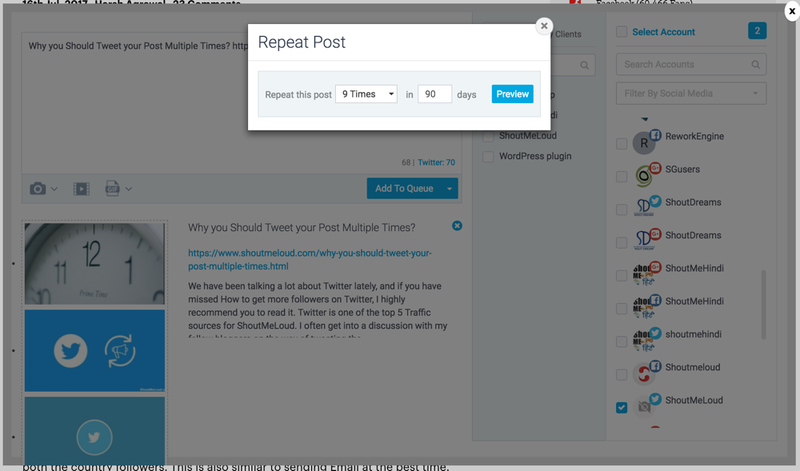 How Should you tweet your blog post multiple times? If it’s a news post: I schedule it to be posted 2-3 times in next 24 hours. If it’s an evergreen post, I schedule it to be published atleast 7-8 times in next 50 days. For daily tweet, make sure you do tweet other articles also. This is because your followers might get annoyed seeing same twitter updates multiple times. Eight-hour gap make sure that most of your followers won’t see the duplicate tweets. Wondering how to repost same tweet multiple times? There are many social media tools that allows you reposting the same content. 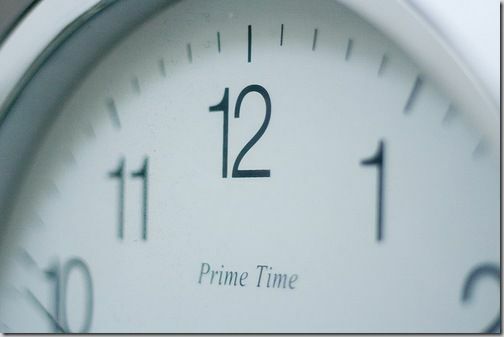 This is a huge time saver for a blogger and busy marketers. Here is a screenshot of adding a repeated tweet using SocialPilot app. Though, I suggest you to use Tools to find the best time to Tweet. 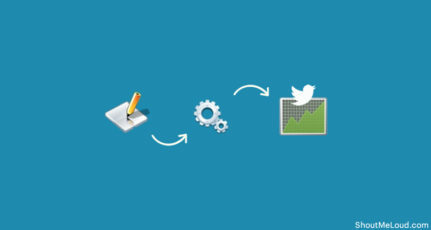 You can use many Twitter web tools to schedule your tweets. I use AgoraPulse for this purpose. You can also make most out of it be scheduling the same tweet after every 7-10 days. This will make sure your old posts will keep getting traffic. Meanwhile, you can also follow me on my personal twitter profile @denharsh to connect with me. Do you tweet your single post multiple times or you tweet once and leave the rest to your readers? Harsh, Nice Strategy will try this out in the next few days, also having more followers also helps increase the reach in this strategy. I’m sure it will help..but don’t over do it and make sure to include hashtag into your tweet keywords. I agree with you Pubudu, overdoing is like killing your own brand. That was a healty tip! I re tweet my older posts every week but didn’t repeated the posting of tweet every 8 hours..
I’m not too sure if this is on the fine line of spamming your followers, if they see the same thing over and over again they are going to unfollow you like a shot! Karen It depends how we take it. For example when I work I stay online for 8-10 hours and after that I’m gone. And similarly after 8 hours your followers from other zone come online and they must have missed your updates which you have made earlier. 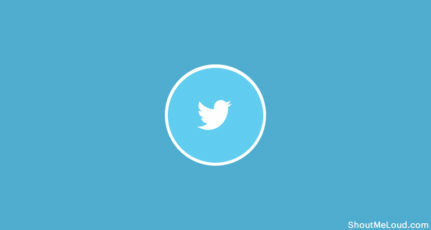 Retweeting will make sure that your followers will not miss that update. Yups Thats a very good strategy..
And yes If you want to tweet a post multiple times in day, then you can use service like hootsuite which provides you scheduling option. You can schedule a same tweet multiple times a day. Hem — i just know about it, i will try . And it give me an idea that we should tweet our old post. Great article friend! I will try HootSuite now! I also tweet 3-4 times per day, it think it’s not too much, and it’s definitely very useful. Interesting thoughts about Retweeting. 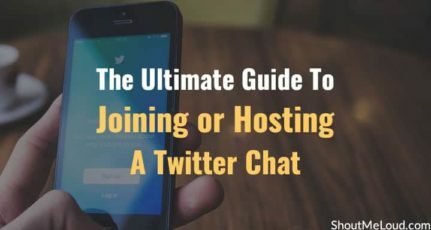 Before going through your article, I was tweeting my blog post once only, but now I’m thinking of doing it multiple times may be 2-3 times for some of popular posts on my blog. I follow the strategy of tweeting tweets from different category. 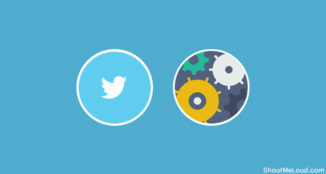 Keeping variation in tweets will help getting your followers attention. Tweeting a post multiple times in a day is good strategy to bring traffic from different countries, but we need to make sure that it should not look like spam tweets. I have used this strategy with my blog and it definitely works! I think tweeting a new post a second time is ok but tweeting out posts that are old is a definite no in my book. i would unfollow anyone who did so, there is promoting your content and then there is overselling it. Tweeting a post multiple times is best option for base articles and not for all. now I use SocialPilot & tweet the same post at least 10 times after gap of 6-10 days. So far I have not faced any issue & this technique seems to be working out great for many.